To understand the issues one has to begin with the constitutional limits. Article 9 of the constitutionrenounces war as a sovereign right of the nation, and the threat or use of force for the settlement of international disputes (Art. 9(1)). It also prohibits the maintenance of armed forces or other war potential (Art. 9(2)). These provisions have been consistently interpreted by the Cabinet Legislation Bureau (CLB) (which is loosely analogous to the US Office of Legal Counsel) and successive governments since the early 1950s, as meaning that Japan was entitled to use force for individual self-defense in the event of an armed attack on Japan; and that Japan was thus entitled to maintain a minimum level of armed forces necessary for such defense. This understanding was also implicitly confirmed by the Supreme Court in the Sunagawa decision, the only decision it has rendered on the issue. But the CLB has also clearly maintained that Art. 9(1) means that Japan is prohibited from any participation in collective self-defense as authorized by Article 51 of the UN Charter, or other collective security operations as authorized by the UN Security Council under Articles 39 and 42 of the UN Charter. There were many within the ruling Liberal Democratic Party (LDP) who have sought to amend Article 9 over the years. But the constitution requires that amendments be initiated by the Diet and approved by a two-thirds vote in each of the two chambers, and then approved by more than a majority of votes cast in a public referendum. This has proved too high a bar for the LDP, due to complex political dynamics and broad public support for Article 9, though in comparative terms the amendment formula is about average in difficulty ((see Donald Lutz, in Sanford Levinson’s Responding to Imperfection: Toward a Theory of Constitutional Amendment). Based in part on the myth that the constitution is too difficult to amend, Prime Minister Abe set out to circumvent the formal amendment process by embarking on a “reinterpretation” project. He established an ad-hoc “panel of experts” to make recommendations on how to “reinterpret” Article 9. This panel, known as the Yanai Committee, had few lawyers and no constitutional scholars among its members. It had no constitutional authority whatsoever to pronounce on the proper interpretation of the constitution. Nonetheless, it submitted a final report [PDF] in 2014, arguing in result-oriented fashion that since the strategic situation around Japan had changed, the meaning of Article 9 must be understood to have also changed. In July 2014, the Cabinet released a resolution [PDF] that purported to “reinterpret” Article 9 in accordance with the Yanai Committee’s recommendations. In particular, it announced that the SDF would be entitled to: (i) use force in response to “an infringement that does not amount to an armed attack;” (ii) provide greater support to the armed forces of the US and other countries involved in armed conflict; and (iii) most controversially, use force in collective self-defense. The use of force in collective self-defense was said to be conditional upon it being: in response to an armed attack on a close ally; in circumstances that constitute a threat to the survival of Japan and “poses a clear danger to fundamentally overturn [the] people’s right to life, liberty and pursuit of happiness;” and where there is no other alternative. Before any debate on the issue in the Diet, the Abe government then had the Cabinet Resolution implemented in revisions to the Guidelines for US-Japan Defense Cooperation, which operationalize the US-Japan Security Treaty. Only after this, with statements that Japan was now committed by this international agreement, did the government introduce the national security legislation that is now under debate in the Diet. These developments pose problems of both process and substance. From a process perspective, this attempt to significantly alter the constitution while deliberately avoiding the formal amendment procedure is profoundly disturbing. It should be stressed that the draft legislation does not constitute a constitutional amendment proposal, or even take the form of the Cabinet Resolution. The bills are merely revisions to national security laws in a manner consistent with the Cabinet Resolution, but in violation of the established understanding of Article 9, with the intent of obliquely effecting a de facto change in constitutional interpretation. This process has been accompanied by clumsy political interference in the leadership of the CLB in order to ensure support for the “reinterpretation,” efforts to intimidate and control the media reporting on the process, and numerous statements by Abe and his ministers that suggest a shocking contempt for constitutionalism. As I have suggested elsewhere, and as has been argued by many constitutional scholars in Japan, this project could weaken the constitutional order and undermine the rule of law in Japan. The effort to effect constitutional change outside of the formal amendment procedure cannot be justified by academic theories of “informal amendment,” or be understood as a natural evolution in constitutional interpretation, as will be discussed further below. And if Article 9 is successfully “reinterpreted” to now permit precisely what it once prohibited, then other provisions—the various rights of the people, other limits on the executive, the status of the Emperor—all are within easy reach of similar “reinterpretation.” Short of that, these efforts have already caused harm to Japan’s democratic institutions—the integrity of the CLB, for one, has been seriously undermined by these events. From a substantive perspective, the Cabinet “reinterpretation” and subsequent legislation are clearly inconsistent with the constitution—not only with the established interpretation of Article 9, but also with any reasonable interpretation of the provision as informed by established principles of constitutional interpretation. Article 9 cannot be understood, when read in the context of the history of its drafting, ratification and subsequent interpretation and operation, to mean that Japan is permitted to engage in collective self-defense (my detailed analysis of Article 9 can be found here). Similarly, increased Japanese logistical and other rear area operations in support of the armed forces of other countries engaged in hostilities could become integral to the actions of the belligerents, thereby constituting a use of force in violation of Article 9. The Nagoya High Court came to that conclusion in a controversial judgment in 2008, and this is consistent with principles articulated in the UN General Assembly resolution on the definition of aggression. Moreover, the purported changes that would permit the SDF to use force in response to “infringements that do not amount to an armed attack,” are inconsistent with international law. In the jus ad bellum regime of the UN system, the use of force in either individual or collective self-defense is only permissible in response to an actual or imminent armed attack. Yet this sly move by the Abe Cabinet would appear to create authority for the use of force in response to lower levels of provocation. This move is consistent with earlier efforts of the LDP, in its formal constitutional amendment proposals [PDF] of 2012, to sever the relationship between Article 9 and the jus ad bellum regime of international law. Many in American policy circles may find these substantive objections absurd, arguing that the constraints imposed by Article 9 are anachronistic and increasingly counterproductive to the regional security interests of Japan and the US. But this is to miss the point. Perhaps there should be a debate in Japan over whether to loosen the constraints of Article 9. But the crucial point here is that if this is to be done, it should be done through formal constitutional amendment, not an illegitimate exercise of Cabinet “reinterpretation” that could serve to weaken the rule of law and fundamental principles of democracy in Japan. Some may object that constitutions generally evolve over time, with changes occurring through mechanisms other than formal amendment—and thus these allegations of illegitimacy are exaggerated. The understanding of any given constitution does indeed evolve, but such development is typically gradual, incremental, constrained by certain principles of interpretation and effected by the institutions that have the constitutional authority to engage in such interpretation. In Japan that is explicitly the judiciary. Through long established convention, the CLB has also emerged as having a legitimate role in such interpretation. The executive, in the form of the Cabinet, has the least claim to any role in such process of incremental interpretation. And as just discussed, the “reinterpretation” here is neither incremental, nor reasonable. Nor can this process be given a pass by reference to theories of “informal amendment” that have been advanced (and are anyway deeply contested) in American constitutional law scholarship. It has never been suggested that such theories could provide ex ante legitimization of deliberate government efforts to circumvent the formal amendment procedures. Moreover, all such theories rely on some measure of popular approval. In Japan we have the executive engaging in an effort that is quite self-conscious in its intent to make a radical and deeply unpopular change to a constitutional provision in disregard of the amendment procedure—a provision that is quite specifically designed to constrain the executive’s actions. It is no exaggeration to say that Japan is in the midst of a constitutional crisis. In June three very prominent constitutional scholars, one of them representing the LDP, testified before a constitutional commission in the Diet. Questions turned to the topic of the national security legislation that was being debated in the Lower House down the hall. All three scholars quite emphatically responded that the draft laws were unconstitutional. Since then over two hundred constitutional scholars and several hundred more legal academics have publicly repudiated the bills. Three former directors of the CLB have come forth to publicly chastise their protégés in the CLB and assert the unconstitutionality of the bills. Five former prime ministers have come out against the legislation. There have been protests involving tens of thousands of people, young and old, in cities across Japan. The government’s approval ratings have dropped from the high 60s to less than 40 percent in less than two months as a result of these developments. The bills were passed in the Lower House earlier this summer, and are before the Upper House for debate and passage in the next month. While the LDP and its junior coalition partner, the Komeito, have the numbers to ensure passage, there is increasing speculation that the Komeito could bolt and that the bills would not pass. That would require the government to override the Upper House with a two-thirds vote in the Lower House—a prospect that would further weaken Abe’s government and undermine the legitimacy of the legislation. If passed the laws are certain to be challenged in court. But most scholars are pessimistic about the prospects of the courts striking down such legislation. The standing doctrine would make claims difficult to mount, and in any event the supreme court is notoriously deferential and weak on such issues. Yet in the wake of virtually unanimous scholarly objection to the draft laws, a perceived failure by the courts to enforce Article 9 could further undermine the credibility and legitimacy of the judiciary—creating yet another collateral victim of this “reinterpretation” process. This process, inimical to the rule of law and constitutionalism, is not consistent with the values that the US espouses to the world, and it cannot be in the long term interests of US foreign policy. 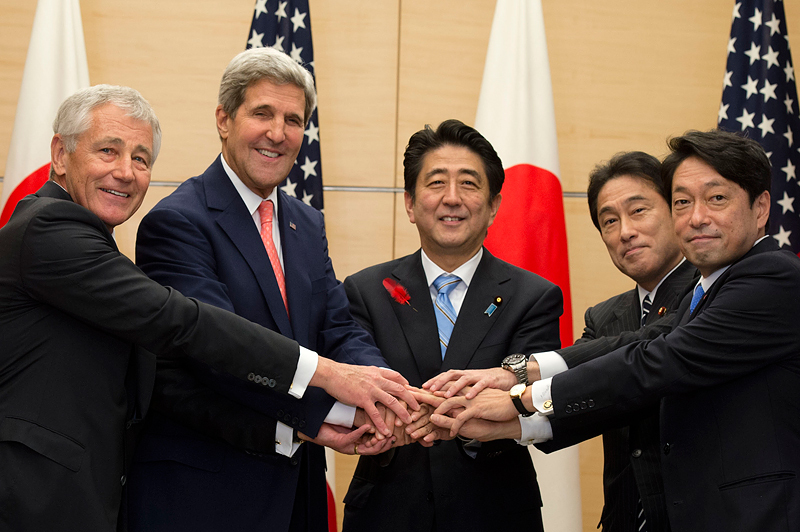 Increased Japanese involvement in international collective security may be a desired goal, but American policy makers should reconsider endorsing this means of getting there.